Speaking yesterday on Fox News about the military coup that overthrew Egyptian President Mohammed Morsi, former United Nations Ambassador and perennial imperial warmonger John Bolton condemned the Obama administration for putting out a "very bland statement" on the coup and appeared to be "taking a pass" on articulating any actual strategy or policy towards Egypt. Bolton suggested President Obama keep the $1.5 billion in U.S. aid "flowing" to Egypt's military, despite being legally obligated by federal statute to shut it off. This is, of course, unsurprising coming from Bolton, who is one of the Egyptian military's biggest cheerleaders. But while Bolton scolded Obama for not speaking out more forcefully on the situation in Egypt, he didn't always feel this way. Not every transfer of power in Egypt deserves the same volume of public statements, apparently. It really depends who's in power and who's in the streets and which ones Bolton likes. Back in February 2011, when the fall of the Mubarak dictatorship was at hand, Bolton was featured on - get this - Fox News to talk about the revolution and American reaction to it. Unsurprisingly, he spent most of the time warning of the danger of Egypt's Muslim Brotherhood and other "radical Islamists" taking over the protests, which, in his words "constitutes a direct threat to the military government." Crediting the "failure of other security forces to bring the demonstrations under control" with justifying "the presence of the [Egyptian] military" on the streets, Bolton said, "I don't think we have evidence yet that these demonstrations are necessarily about democracy," adding, "Let's be clear what the stakes are for the United States: we've got an authoritarian regime in power that's been our ally. We don't know at this point what the real alternatives are." In response to reports of the growing military presence on the streets of Egypt, including some that the army had opened fire on protesters (which the Fox News anchor Jon Scott kindly suggested was "one way to quell a rebellion"), Bolton said, "I don't think that just because you have people climbing onto tanks, you can assume that they are friendly to democratic values" and warned that the Muslims Brotherhood was "determined to bring down this secular, military government and install one of very harsh Sharia law, which would have enormous implications for the United States, for Israel, for other Arab governments in the region." 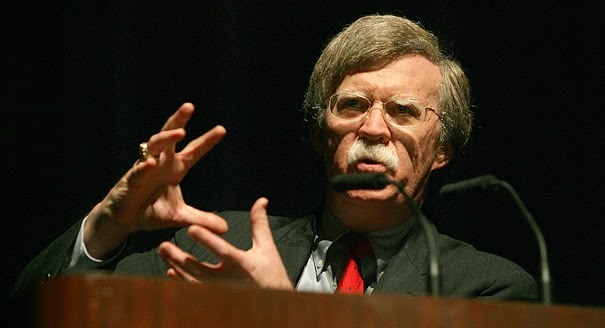 Above all, however, Bolton stressed that the U.S. government should steer clear of making any statements regarding Egypt at this time: "The Obama administration should remain prudently silent publicly and be working behind the scenes to try and find out, to try and understand better what the ground truth really is in Cairo and other major cities." Remain prudently silent publicly, was the suggestion then. But, of course, when Bolton doesn't like the government, statements should be shouted from the rooftops. Recall, for instance, June 2009, when the same John Bolton spoke to - wait for it - Fox News about the official U.S. reaction to protests in Tehran, following the reelection of Mahmoud Ahmadinejad. He accused Obama of being both "timid" and "disingenuous" by not forcefully speaking out in favor of Iranian demonstrators and against the Iranian government. Of course, the guy who fretted over "abandoning the people" of Iran has been aggressively advocating for those very people to be bombed to death for years and has long supported the Mojahadeen-e Khalq (MEK), an exiled Iranian Islamist/Marxist militant cult with virtually no domestic Iranian support and which was designated a foreign terrorist organization by the United States until recently. John Bolton misses the salad days of Hosni Mubarak when a corrupt dictator did America's bidding on behalf of Israel. When Mubarak was deposed, Bolton even urged Israel to take the opportunity to bomb Iran. Seriously. Now that Morsi is out, Bolton says the Obama administration "has just apparently been inactive" in Egypt, even though recent reports have revealed this is probably far from the truth. Looking forward, the next time people halfway across the globe take to the streets to protest their government, John Bolton will surely let us know whether to say anything or not.